In agriculture, it is not only yield that counts, But also the stability of yields over several years. A meta-analysis by a team from the Technical University of Munich (TUM) and Agroscope in Zurich has investigated how organic and conventional agriculture differ in this regard. Improving global food production and security is one of the biggest challenges of our time. The goal of organic agriculture is to minimize the negative effects on humans and nature by avoiding mineral fertilizers and synthetically produced pesticides. In addition, stable agricultural production is important – especially in view of the expected greater fluctuations due to climate change. But so far there is little knowledge about how organic and conventional agriculture differ in terms of annual yield fluctuations. Samuel Knapp from the Chair of Plant Nutrition at the Technical University of Munich and Marcel van der Heijden from the Swiss Center for Agricultural Research, Agroscope, thus investigated annual yield variations in a meta-analysis of previously published studies. In total, they used165 direct comparisons from 39 published studies. As expected, the analysis confirmed that organic farming produces lower yields than conventional farming – on average 16 percent lower across all crops. The differences in stability between the two cultivation systems can be attributed, among other things, to higher fertilization with nitrogen and phosphorus in conventional cultivation. Organic farms can improve their yield stability with green manure and time-optimized fertilization. In their study, the researchers also investigated the effect of reduced tillage. This often has a positive effect on soil structure and soil organisms, but is also known to result in slightly lower yields. The two scientists compared the yield stability in 367 paired, long-term comparisons of reduced and conventional tillage. The result: The difference in yield, although measurable, amounted to merely two percent. 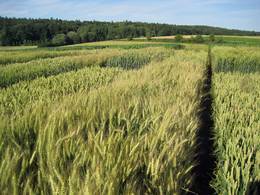 The researchers found no significant differences regarding yield stability. The project was funded by the Swiss Competence Center for Agricultural Research, Agroscope and the Swiss National Science Foundation.